"We selected InnoMedia for their world class products, technologies, responsiveness, and commitment. InnoMedia worked closely with the Time Warner Team to customize the Enterprise SIP Gateway products, meeting the performance criteria and the IMS interoperability requirements for our commercial service. We are delighted with the robustness and quality of InnoMedia's ESBC device and technical ability." "I have never experienced such a fast implementation. I honestly believe that, as the best partner, InnoMedia has the world's best technology on Voice-over-IP in terms of the quality and the speed of implementation. I can proudly promise to any Dreamcast user that Dreamcast has now the best Internet live chatting capability to play with real communication of emotion, and becomes the machine to be connected to any telephone and Dreamcast console around the world at a very low cost." "North Rock Communications is a very well established company in Bermuda, providing voice and data services over our Wimax and fixed infrastructure for Corporate and Residential customers. We tested and evaluated the performance of the Innomedia 2 line / 4 line and 8 line units and were very pleased with the performance, quality, robustness, ease of automatic deployment and above all the excellent technical support. North Rock now use Innomedia units as the equipment of choice for all voice services in our network and we are now looking at deploying them in some of our Caribbean locations." "Cablevision has been working with InnoMedia to develop unique products to enable VoIP services to be deployed in Cablevision's systems in the New . We have found InnoMedia to be a very satisfactory company to deal with in all respects. They have shown a very high level of technical expertise in the development and manufacture of the MTA's we are using, all technical developments have been achieved in a timely and effective manner. InnoMedia have met all our time frames and milestones for development and supply of equipment. In summary, working with InnoMedia has been a satisfying and positive experience." "InnoMedia worked closely with us to customize products that met all performance criteria for our VoiceLine service. We are delighted with the robustness and quality of InnoMedia MTAs and the professionalism of the InnoMedia organization." "InnoMedia has worked with us as a partner, not just a vendor, and is committed to helping us have successful deployments." "ThinRoute Technologies, Inc. selected the Innomedia MTA for integration into our Outdoor Residential Gateway product in 2004. Over the years these units have been deployed from Alaska to south Texas in environments that exceed the manufacturers specifications and have performed well beyond our expectations. Any time we have needed technical support, Innomedia has been immediately responsive and effective in addressing our needs." "CTI has used Innomedia ATA’s in inmate facilities for over six years. Rarely do we encounter problems, but when we do, the technical support has been superb. Because of this high level of reliability and support, I view InnoMedia as a strategic business partner." InnoMedia was founded in September 1995 by two pioneers in the multimedia and telecommunications industries: Kai-Wa Ng, formerly the co-founder and CTO of Creative Technology Ltd. where he developed the Sound Blaster ® – the world’s most popular sound card which has sold more than 100 million units to date, and Dr. Nan-Sheng Lin, formerly Chief Scientist and VP of Cellular and Digital Radio at Teknekron Communications Systems, where he was an early leader in the development of digital cellular phones. InnoMedia’s mission is to harness the power of broadband and IP to facilitate efficient and productive communication. InnoMedia’s founding vision is to deliver INNOvative multiMEDIA through the convergence of voiceand data into a unified platform and network, envisioning IP as the prevalent technology unifying these mediums to create and deliver information-rich communication. As one of the early pioneers in VoIP, InnoMedia has taken an end-to-end systems approach to deliver advanced and innovative CPE (Customer Premise Equipment) as well as network equipment for converged IP networks. 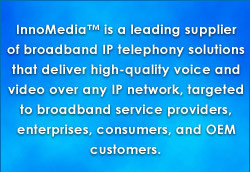 With in-depth knowledge and experience in communications protocols, voice media processing and QoS management techniques, combined with a dedicated focus on integration, optimization and interoperability, InnoMedia delivers true end-to-end IP telephony solutions. InnoMedia’s groundbreaking technologies have been granted 18 patents with over 30 additional patents pending or in process. In addition, InnoMedia has received 25 industry awards for its technologies and products. InnoMedia offers a portfolio of Broadband IP Telephony products and solutions including low and high-port MTAs, TDM-PRI SIP gateways, Enterprise SIP gateways (ESGs) or Enterprise Session Border Controllers (ESBCs), cable solutions, and Element Management Systems. InnoMedia is a privately held company. Investors include – Creative Technology Ltd., ISAO, and WI Harper Group.